Introduction: Laparoscopic pancreaticoduodenectomy for the management of Periampullary malignancy is emerging. It is still not accepted as the standard of care, in spite of it having the benefits of minimal access surgery like less post operative pain, early recovery etc. The main controversy with this procedure is the doubts raised with regard to the extent of oncological radicality that can be obtained, especially when tissues along the superior mesenteric vessels, retroperitoneum and lymph nodes are not adequately removed. 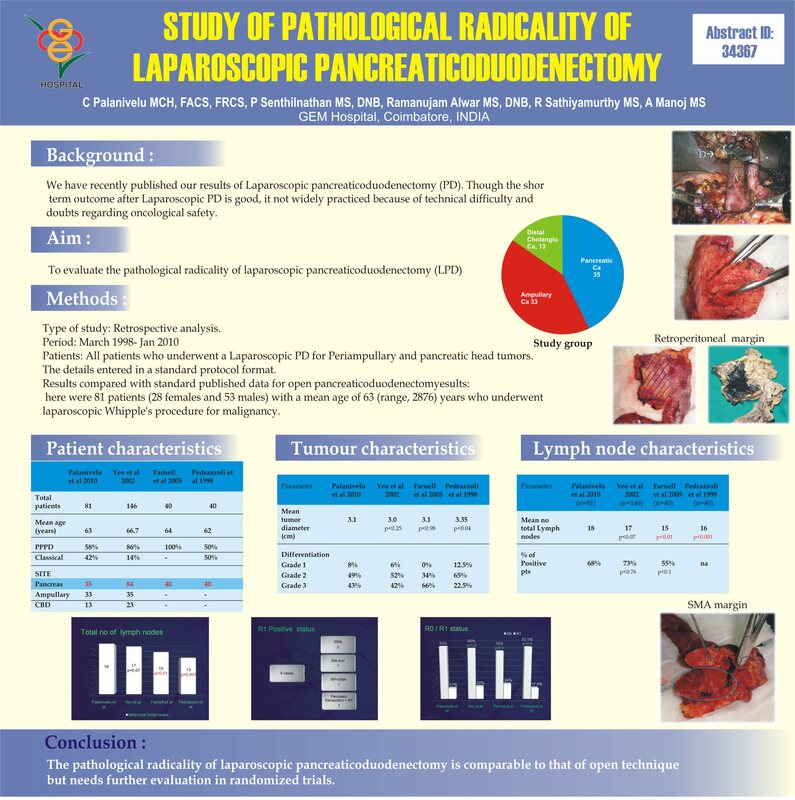 This paper evaluates the pathological radicality of laparoscopic pancreaticoduodenectomy. Methods: Pathological data of patients who underwent laparoscopic pancreaticoduodenectomy for malignant periampullary tumours from March 1998 to January 2010 was prospectively and retrospectively reviewed and analyzed. These results are compared with standard published data for open Whipple’s and studied. Results: There were 84 patients (28 females and 56 males) with a mean age of 63 (range, 28-76) years who underwent laparoscopic Whipple’s procedure. The indications for surgery were ampullary malignancies (33), pancreatic head adenocarcinoma including other pancreatic tumours (35), distal cholangio carcinoma (13), and chronic pancreatitis (3).So the study group had 81 patients having malignant lesions. There were no R2 resections and the R1 resection was seen in 6 patients. The Retroperitoneal and SMA margin status were evaluated in 52 patients and was positive in 2 and 4 patients respectively with the average clearance to the inked margin being 12mm and 9 mm respectively. The Pancreatic transection margin was positive in 1 patient and average margin length is 1.9 cm. The CBD margin was positive in 1 patient and the average margin length is 2.3cm. The proximal stomach or duodenal margin was negative in all patients and average margin length was 9.7cm. The distal duodenal or jejunal margin was negative in all the patients and the average margin length was 20.4cm. The average number of lymph nodes retrieved was 18 (range is 8-24).